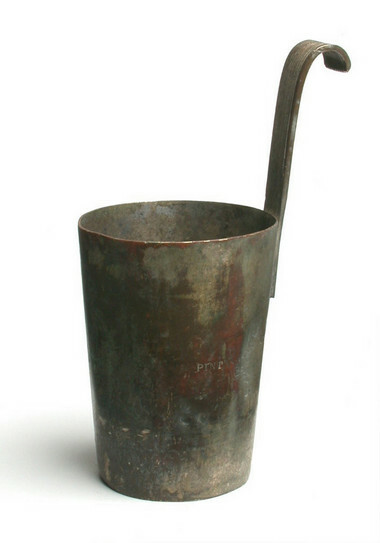 This is a metal ladle used by milk sellers in the past to pour a precise measure of milk for a customer. It is difficult to date, but measuring ladles like this were used in the 19th century and up until the widespread delivery of bottled milk after World War II. The ladle is made from tinplate and has a curved metal handle so that it could hang on the side of the milk delivery can. Milk measures were made in a variety of sizes. This one holds a pint. Milk was delivered to homes in many ways. For example, in rural areas, the cow was walked from house to house and milked on request for the customer. In cities, milkmaids carried heavy cans of milk and measured a pint from the can into the customer's own dish or jug. Later in the 19th century and 20th century the milk was transported from house to house by pony and cart or on a milk perambulator. Milk was delivered or could be purchased from shops twice a day, early in the morning and again in the afternoon, as cows were milked twice a day. The quality of a lot of the milk was questionable. Often the cream was skimmed off the top and then it was watered down by the milk retailer in the dairy before setting out on the milk round. The water pump in the dairy was sometimes referred to as 'the cow with the iron tail'. As the water used could be contaminated with diseases such as typhoid, this was a dangerous practice. Some wealthier families had their own special churn cleaned and sealed in the dairy, so as to prevent the contamination and adulteration of the milk by unscrupulous milk sellers. In Britain, people drink a lot more milk today than they did in the past - up to four pints (2,272mls) a week each. Milk has not always been so safe to drink, especially in cities. Before 1860s most milk was consumed in the form of hard cheese rather than drunk as fresh liquid. Milk was sold at different prices according to the quality. In 1869 the inferior milk was 4 pence a quart and the better quality milk or 'babies milk' was 5 pence a quart. In 1845 a pamphlet Observations on London Milk found that most milk consumed in London was contaminated with traces of blood or pus from infected cows. In 1847 The Lancet linked contaminated milk from town dairies to the spread of tuberculosis. Many city dairies and cow yards operated under insanitary conditions. Animals were kept in confined spaces, standing in their own excrement and fed on poor quality feed rather than enjoying the fresh grass and clean air of the countryside dairy herds. In 1860 and 1863 two serious epidemics - rinder pest and pleuropneumonia - killed thousands of cattle, effectively destroying the town dairies for ever. The Lancet investigations resulted in measures to regulate the dairy industry. In 1860 a Food and Drugs Act was passed and the Board of Agriculture, which later became the Ministry of Agriculture, was formed. With the advancement of the railways, fresh milk was brought from the countryside and by 1866 this is how the majority of Londoners got their milk. The introduction of pasteurisation to the dairy industry in 1890 began to make milk safer to drink. However, measuring out milk on the doorstep into containers provided by the customer could still lead to contamination of the milk, even if it was clean when it left the dairy. A solution was found in the form of the glass milk bottle invented in 1884. Bottles were sterilised and sealed before leaving the dairy. Today we buy milk in sealed cartons or bottles. When something is made poorer in quality by adding another substance to it. A hand held cart with three wheels used to transport a large churn of milk. Also known as a dairy pram.